370. 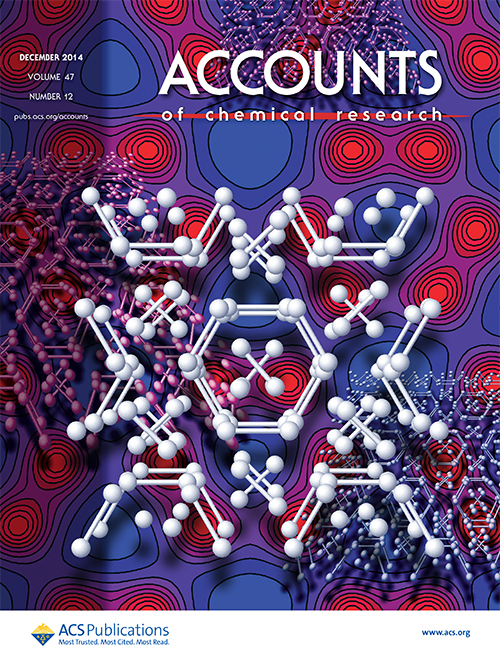 Murialdo, M., C. Ahn, and B. T. Fultz, A thermodynamic investigation of adsorbate-adsorbate interactions of carbon dioxide on nanostructured carbons, AIChE Journal, in press. 369. Yang, H., N. J. Weadock, H. Tan, and B. T. Fultz, High capacity V-based metal hydride electrodes for rechargeable batteries, J. Mat. Chem. A., in press. 368. Chen, B., R. Hoffman, and R. Cammi, The effect of pressure on organic reactions in fluids - a new theoretical perspective, Angew. Chem. Int. Ed., in press. 367. Geballe, Z. M., H. Liu, A. K. Mishra, M. Ahart, M. Somayazulu, Y. Meng, M. Baldini, and R. J. Hemley, Synthesis and stability of lanthanum superhydrides, Nature Mater., submitted. 366. Stefanoski, S., G. J. Finkelstein, M. D. Ward, T. Zeng, K. Wei, E. S. Bullock, C. M. Beavers, H. Liu, G. S. Nolas, and T. A. Strobel, Zintl ions within framework channels: the complex structure and low-temperature transport properties of Na4Ge13, J. Am. Chem. Soc., submitted. 364. Haberl, B., M. Guthrie, G. Shen, J. S. Williams, and J. E. Bradby, Density-dependent irreversibility in the phase diagram of silicon, Phys. Rev. Lett., submitted. 363. Miao, M., R. Hoffmann, I. I. Naumov, and R. J. Hemley, Quasimolecules in compressed lithium, Nature, submitted. 362. Liu, G., S. Besedin, A. Irodova, H. Liu, G. Gao, M. Eremets, X. Wang, and Y. Ma, Nb-H system at high pressures and temperatures, Phys. Rev. B submitted. 361. Yim, W. L., H. Shi, Y. Liang, R. J. Hemley, and J. S. Tse, Band gaps and effective oscillator models for solid hydrogen and H2O ice at high pressure, in Correlations in Condensed Matter under Extreme Conditions (eds. G. G. N. Angilella and La Magna, A. ), submitted (World Scientific). 360. Zha, C. S., H. Liu, J. S. Tse, and R. J. Hemley, Melting and high P-T transitions of hydrogen to 300 GPa, Phys. Rev. Lett. 119, 075302 (2017). 359. Boehler, R., J. Molaison, and B. Haberl, Novel diamond cells for neutron diffraction using multi-carat CVD anvils, Rev. Sci. Instrum. 88, 083905 (2017). 358. Kizzire, D. G., S. Dey, R. A. Mayanovic, R. Sakidja, K. Landskrom, M. Mandal, Z. Wang, and M. Benamara, Studies of the mechanical and extreme hydrothermal properties of periodic mesoporous silica and aluminosilica materials, Micropor. Mesopor. Mater. 252, 69-78 (2017). 357. Liu, H., I. I. Naumov, R. Hoffmann, N. W. Ashcroft, and R. J. Hemley, Potential high-Tc superconducting lanthanum and yttrium hydrides at high pressure, Proc. Natl. Acad. Sci., 10.1073/pnas.1704505114 (2017). 356. Elatresh, S. F., W. Cai, N. W. Ashcroft, R. Hoffman, S. Deemyad, and S. A. Bonev, Evidence from Fermi surface analysis for the low-temperature structure of lithium, Proc. Nat. Acad. Sci. USA 114, 5389-5394 (2017). 355. Hu, M., J. He, Z. Zhao, T. A. Strobel, W. Hu, D. Yu, H. Sun, L. Liu, Z. Li, M. Ma, Y. Kono, J. Shu, M. K. Mao, Y. Fei, G. Shen, Y. Wang, S. J. Juhl, J. Y. Huang, Z. Liu, B. Xu, and Y. Tian, Compressed glassy carbon: An ultrastrong and elastic interpenetrating graphene network, Sci. Adv. 3, e1603213 (2017). 354. Elatresh, S. F., W. Cai, N. W. Ashcroft, R. Hoffman, S. Deemyad, and S. A. Bonev, Evidence from Fermi surface analysis for the low-temperature structure of lithium, Proc. Nat. Acad. Sci. USA 114, 5389-5394 (2017). 353. Bhadram, V. S., L. Krishna, E. S. Toberer, R. Hrubiak, E. Greenberg, V. B. Prakapenka, and T. A. Strobel, Pressure-induced structural transition in chalcopyrite ZnSiP2, Appl. Phys. Lett. 110, 182106 (2017). 352. Tong, X., X. Xu, B. Fultz, H. S. Zhang, T. A., and D. Y. Kim, Phonons in Si24 at simultaneously elevated temperature and pressure, Phys. Rev. B 95, 094306 (2017). 351. Zhang, H., H. Liu, K. Wei, O. O. Kurakevych, Y. Le Godec, Z. Liu, J. Martin, M. Guerette, G. S. Nolas, and T. A. Strobel, BC8 silicon (Si-III) is a narrow-gap semiconductor, Phys. Rev. Lett. 118, 146601 (2017). 350. Dey, S., M. D. Hossain, R. A. Mayanovic, R. Wirth, and R. A. Gordon, Novel highly ordered core–shell nanoparticles, J. Mater. Sci. 52, 2066-2076 (2017). 349. Pu, C., D. Zhou, Y. Li, H. Liu, Z. Chen, Y. Wang, and Y. Ma, Two-dimensional C4N global minima: Unique structural topologies and nano-electronic properties, J. Phys. Chem. C, 121, 2669-2674 (2017). 348. Zhao, Z., H. Zhang, D. Y. Kim, W. Hu, E. S. Bullock, and T. A. Strobel, Properties of the exotic metastable ST12 germanium allotrope, Nature Comm. 8, 13909 (2017). 347. Guthrie, M., C. G. Pruteanu, M. E. Donnelly, J. J. Molaison, A. M. dos Santos, J. S. Loveday, R. Boehler, and C. A. Tulk, Radiation attenuation by single-crystal diamond windows, J. Appl. Cryst. 20, 76-86 (2017). 346. Yamanaka, T., M. Ahart, H. K. Mao, and T. Suzuki, Electron hybridization and anharmonic thermal vibration effect on structure transition of SrTiO3 at high-pressure and low-temperature, Solid State Comm. 249, 54-59 (2017). 345. Miao, M., R. Hoffmann, I. I. Naumov, and R. J. Hemley, Quasimolecules in compressed lithium, Agnew. Chem. Int. Ed. 56, 972-975 (2017). 344. Yamamoto, Y., H. Yamaoka, M. Tanaka, H. Okazaki, T. Ozaki, Y. Takano, J. F. Lin, H. Fujita, T. Kagayama, K. Shimizu, N. Hiraoka, H. Ishii, Y. F. Lao, K. D. Tsuei, and J. Mizuki, Origin of pressure-induced superconducting phase in KxFe2−ySe2 studied by synchrotron x-ray diffraction and spectroscopy, Sci. Reports 6, 30946 (2016). 343. Bai, D. C., F. L. Yu, W. Y. Wang, D. Chen, H. Li, Q. R. Liu, C. H. Ding, B. Chen, and X. L. Hou, Palladium/N-heterocyclic carbene catalysed regioand diastereoselective reaction of ketones with allylreagents via inner-sphere mechanism, Nature Comm. 7, 11806 (2016). 342. Rahm, M. and R. Hoffmann, Distinguishing bonds, J. Am. Chem. Soc. 138, 3731-3744 (2016). 341. Zheng, H., L. Wang, K. Li, Y. Yang, Y. Wang, J. Wu, X. Dong, C. H. Wang, C. A. Tulk, J. J. Molaison, I. N. Ivanov, M. Feygenson, W. Yang, M. Guthrie, Y. Zhao, H. K. Mao, and C. Jin, Pressure induced polymerization of acetylide anions in CaC2 and 107 fold enhancement of electrical conductivity, Chem. Sci. 8, 298-304 (2016). 340. Zhu, S., F. Peng, H. Liu, A. Majumdar, T. Gao, and Y. Yao, Stable calcium nitrides at ambient and high pressures, Inorg. Chem. 55, 7550-7555 (2016). 339. Tsuji, Y., P. L. V. K. Dasari, S. F. H. Elatresh, R., and N. W. Ashcroft, Structural diversity and electron confinement in Li4N: Potential for 0-D, 2-D, and 3-D electrides, J. Am. Che. Soc. 138, 14108-14120 (2016). 338. Shiell, T. B., D. G. McCulloch, J. E. Bradby, B. Haberl, R. Boehler, and D. R. McKenzie, Nanocrystalline hexagonal diamond formed from glassy carbon, Sci. Reports 6, 37232 (2016). 337. Hemawan, K. W., D. W. Keefer, J. V. Badding, and R. J. Hemley, Generation of microwave capillary argon plasmas at atmospheric pressure, IEEE Trans. Plasma Sci. 44, 2603-2607 (2016). 336. Yang, F., Y. Lin, M. Baldini, J. E. P. Dahl, R. M. K. Carlson, and W. L. Mao, Effects of molecular geometry on the properties of compressed diamondoid crystals, J. Phys. Chem. Lett. 7, 4641-4647 (2016). 335. Zhang, H., K. Li, G. D. Cody, C. A. Tulk, X. Dong, G. Gao, J. J. Molaison, X. Liu, M. Feygenson, W. Yang, I. N. Ivanov, L. Basile, J. C. Idrobo, M. Guthrie, and H. K. Mao, Polymerization of acetonitrile via a hydrogen transfer reaction from CH3 to CN under extreme conditions, Angew. Chem. Int. Ed. 55, 12040-12044 (2016). 334. Wu, L., B. Wan, H. Liu, H. Guo, Y. Yao, Z. Li, J. Zhang, F. Gao, and H. K. Mao, Coexistence of superconductivity and superhardness in beryllium hexaboride driven by inherent multicenter bonding, J. Phys. Chem. Lett. 7, 4898-4904 (2016). 333. Naumov, I. I. and R. J. Hemley, Topological surface states in dense solid hydrogen, Phys. Rev. Lett. 117, 206403 (2016). 332. Li, X., H. Liu, and F. Peng, Crystal structure and superconductivity of technetium hydrides under pressure, Phys. Chem. Chem. Phys. 18, 28791 (2016). 331. Vinitsky, E. A., T. Muramatsu, M. Somayazulu, W. K. Wanene, Z. Liu, D. Chandra, and R. J. Hemley, Structural, vibrational, and electronic properties of BaReH9 under pressure, J. Phys. : Cond. Matt. 28, 505701 (2016). 330. Strobel, T. A., M. Somayazulu, S. V. Sinogeikin, P. Dera, and R. J. Hemley, Hydrogen-stuffed, quartz-like water ice, J. Am. Chem. Soc. 138, 13786-13789 (2016). 329. Liu, H., I. I. Naumov, and R. J. Hemley, Dense hydrocarbon structures at megabar pressures, J. Phys. Chem. Lett. 7, 4218-4222 (2016). 328. Haberl, B., T. A. Strobel, and J. E. Bradby, Pathways to exotic metastable silicon allotropes, Appl. Phys. Rev. 3, 040808 (2016). 327. Baldini, M., P. Postorino, L. Malavasi, C. Marini, K. V. Chapman, and H. K. Mao, Pair distribution function analysis: The role of structural degrees of freedom in the high-pressure insulator to metal transition of VO2, Phys. Rev. B 93, 245137 (2016). 326. Kurakevych, O. O., Y. L. Godec, W. A. Crichton, J. Guignard, T. A. Strobel, H. Zhang, H. Liu, C. C. Diogo, A. Polian, N. Menguy, S. J. Juhl, and C. Gervais, Synthesis of bulk BC8 silicon allotrope by direct transformation and reduced-pressure chemical pathways, Inorg. Chem. 55, 8943-8950 (2016). 324. Struzhkin, V. V., D. Y. Kim, E. Stavrou, T. Muramatsu, H. K. Mao, C. J. Pickard, R. J. Needs, V. B. Prakapenka, and A. F. Goncharov, Synthesis of sodium polyhydrides at high pressures, Nature Comm. 7, 12267 (2016). 323. McWilliams, R. S., D. A. Dalton, M. F. Mahmood, and A. F. Goncharov, Optical properties of fluid hydrogen at the transition to a conducting state, Phys. Rev. Lett. 116, 255501 (2016). 322. Murialdo, M., N. P. Stadie, C. C. Ahn, and B. Fultz, A Generalized Law of Corresponding States for the physisorption of classical gases with cooperative adsorbate-adsorbate interactions, J. Phys. Chem. C 120, 11847-11853 (2016). 321. Tracy, S. J., L. Mauger, H. L. Smith, H. J. Tan, J. E. Herriman, Y. M. Xiao, and B. T. Fultz, Polaron mobility and disordering of the sodium sublattice in triphylite-NaxFePO4, Chem. Mater. 28, 3051-3059 (2016). 320. Muramatsu, T., L. V. Gasparov, H. Berger, R. J. Hemley, and V. V. Struzhkin, Electrical resistance of single-crystal magnetite (Fe3O4) under quasi-hydrostatic pressures up to 100 GPa, J. Appl. Phys. 119, 135903 (2016). 319. Mandal, M., A. S. Manchanda, C. Liu, Y. Fei, and K. Landskron, A high-pressure synthesis of hydrothermally stable periodic mesoporous crystalline aluminosilica materials, RSC Adv. 6, 7396-7402 (2016). 318. Xu, P. and R. Hoffmann, The dimerization of H2NO, J. Phys. Chem A 120, 1283-1296 (2016). 317. Murphy, C. A., Hydrogen in the Earth's core: Review of the structural, elastic, and thermodynamic properties of iron-hydrogen alloys, in Deep Earth: Physics and Chemistry of the Lower Mantle and Core (eds. H. Terasaki and Fischer, R. A. ), 255-264 (American Geophysical Union, Washington, DC, 2016). 316. Errea, I., M. Calandra, C. J. Pickard, J. R. Nelson, R. J. Needs, Y. Li, H. Liu, Y. Zhang, Y. Ma, and F. Mauri, Quantum hydrogen-bond symmetrization in the superconducting hydrogen sulfide system, Nature 532, 81-85 (2016). 315. Dey, S., S. T. Anderson, R. A. Mayanovic, R. Sakidja, K. Landskron, B. Kokoszka, M. Mandal, and Z. Wang, Experimental and theoretical investigation of a mesoporous KxWO3 material having superior mechanical strength, Nanoscale 8, 2937-2943 (2016). 314. Lu, S., H. Liu, I. I. Naumov, S. Meng, Y. Li, J. S. Tse, B. Yang, and R. J. Hemley, Superconductivity in dense carbon-based materials, Phys. Rev. B 93, 104509 (2016). 313. Hermann, A., M. Derzsi, W. Grochala, and R. Hoffmann, AuO: Evolving from dis- to comproportionation and back again, Inorg. Chem. 55, 1278-1286 (2016). 312. Satapathy, S., M. Ahart, D. Dandekar, R. J. Hemley, B. Schuster, and P. Khoma, Single-crystal elastic properties of aluminum oxynitride (AlON) from Brillouin scattering, J. Am. Ceram. Soc. 99, 1383-1389 (2016). 311. Karandikar, A. and R. Boehler, Flash melting of tantalum in a diamond cell to 85 GPa, Phys. Rev. B 93, 054107 (2016). 310. Bhadram, V. S., D. Y. Kim, and T. A. Strobel, High-pressure synthesis and characterization of incompressible titanium pernitride, Chem. Mater. 28, 1616-1620 (2016). 309. Liu, H., Y. Li, G. Gao, J. S. Tse, and I. I. Naumov, Crystal structure and superconductivity of PH3 at high pressures, J. Phys. Chem. C 120, 3458-3461 (2016). 308. Yamanaka, T., Y. Nakamoto, F. Takei, M. Ahart, H. K. Mao, and R. J. Hemley, Pressure-induced ferroelectric to paraelectric transition in LiTaO3 and (Li,Mg)TaO3, J. Appl. Phys. 119, 075902 (2016). 307. Li, Y., L. Wang, H. Liu, Y. Zhang, J. Hao, C. J. Pickard, J. R. Nelson, R. J. Needs, W. Li, Y. Huang, I. Errea, M. Calandra, F. Mauri, and Y. Ma, Dissociation products as structures of solid H2S at strong compression, Phys. Rev. B 93, 020103(R) (2016). 306. Sherafati, M., M. Baldini, L. Malavasi, and S. Satpathy, Percolative metal-insulator transition in LaMnO3, Phys. Rev. B 93, 024107 (2016). 305. Zhan, H., G. Zhang, Y. Zhang, V. B. C. Tan, and J. M. G. Bell, Y., Thermal conductivity of a new carbon nanotube analog: The diamond nanothread, Carbon 98, 232-237 (2016). 304. Krishna, L. and C. A. Koh, Inorganic and methane clathrates: Versatility of guest–host compounds for energy harvesting, MRS Energ. Sustain. 2, E8 (2015). 303. Miao, M. S. and R. Hoffmann, High-pressure electrides: The chemical nature of interstitial quasiatoms, J. Am. Chem. Soc. 137, 3631-3637 (2015). 302. Li, K., H. Zeng, T. Hattori, A. Sano-Furukawa, C. A. Tulk, J. Molaison, M. Feygenson, I. N. Ivanov, W. Yang, and H. K. Mao, Synthesis, structure and pressure-induced polymerization of Li2Fe(CN)6 accompanied with enhanced conductivity, Inorg. Chem. 54, 11276-11282 (2015). 301. Stagno, V., L. Bindi, C. Park, S. Tkachev, V. B. Prakapenka, H. K. Mao, R. J. Hemley, P. J. Steinhardt, and Y. Fei, Quasicrystals at extreme conditions: The role of pressure in stabilizing icosahedral Al63Cu24Fe13 at high temperature, Am. Mineral. 100, 2412-2418 (2015). 300. Naumov, I. I., R. J. Hemley, R. Hoffmann, and N. W. Ashcroft, Chemical bonding in hydrogen and lithium under pressure, J. Chem. Phys. 143, 064702 (2015). 299. Peng, F., Y. Han, H. Liu, and Y. Yao, Exotic stable cesium polynitrides at high pressure, Sci. Reports 5, 16902 (2015). 298. Hao, J., H. Liu, W. Lei, X. Tang, J. Lu, D. Liu, and Y. Li, Prediction of a superhard carbon-rich CN compound comparable to diamond, J. Phys. Chem. C 119, 28614 (2015). 297. Li, K., H. Zheng, L. Wang, C. A. Tulk, J. Molaison, M. Feygenson, W. Yang, M. Guthrie, and H. K. Mao, K3Fe(CN)6 under external pressure: Dimerization of CN− coupled with electron transfer to Fe(III), J. Phys. Chem. C 119, 22351-22356 (2015). 296. Stadie, N. P., M. Murialdo, C. C. Ahn, and B. Fultz, Unusual entropy of adsorbed methane on zeolite-templated carbon, J. Phys. Chem. C 119, 26409-26421 (2015). 295. Klier, K. and K. Landskron, Thermodynamically controlled high-pressure high-temperature synthesis of crystalline flourinated sp3-carbon networks, J. Phys. Chem. C 119, 26086-26090 (2015). 294. Feng, X., J. Zhang, G. Gao, H. Liu, and H. Wang, Compressed sodalite-like MgH6 as a potential high-temperature superconductor, RSC Adv. 5, 59292 (2015). 293. Liu, Y., D. Duan, F. Tian, H. Liu, C. Wang, X. Huang, D. Li, Y. Ma, B. Liu, and T. Cui, Pressure-induced structures and properties in indium hydrides, Inorg. Chem. 54, 9924-9928 (2015). 292. Li, Y., J. Hao, H. Liu, S. Lu, and J. S. Tse, High-energy density and superhard nitrogen-rich B-N compounds, Phys. Rev. Lett. 115, 105502 (2015). 291. Zhang, M., G. Gao, A. Kutana, Y. Wang, X. Zou, J. S. Tse, B. I. Yakobson, H. Li, H. Liu, and Y. Ma, Two-dimensional boron–nitrogen–carbon monolayers with tunable direct band gaps, Nanoscale 7, 12023 (2015). 290. Rahm, M. and R. Hoffmann, Towards an experimental quantum chemistry: Exploring a new energy partitioning, J. Am. Chem. Soc. 137, 10282-10291 (2015). 289. Muramatsu, T., W. K. Wanene, M. Somayazulu, E. Vinitsky, D. Chandra, T. A. Strobel, V. V. Struzhkin, and R. J. Hemley, Metallization and superconductivity in the hydrogen-rich ionic salt BaReH9, J. Phys. Chem C 119, 18007-18013 (2015). 288. Chen, B., R. Hoffmann, N. W. Ashcroft, J. V. Badding, E. Xu, and V. Crespi, Linearly polymerized benzene arrays as intermediates, tracing pathways to carbon nanothreads, J. Am. Chem. Soc. 137. 14373-14386 (2015). 287. Hemawan, K. W., H. Gou, and R. J. Hemley, Diamond synthesis at atmospheric pressure by microwave capillary plasma chemical vapor deposition, Appl. Phys. Lett. 107, 181901 (2015). 286. Yamanaka, T., A. Kyono, Y. Nakamoto, S. Kharlamova, V. V. Struzhkin, S. A. Gramsch, H. K. Mao, and R. J. Hemley, A new high pressure phase of Fe2SiO4 and the relationship between spin and structural transitions, Am. Mineral. 100, 1736-1717 (2015). 285. Zeidler, A., M. Guthrie, and P. S. Salmon, Pressure-dependent structure of the null-scattering alloy Ti0.676Zr0.624, High Press. Res. 35, 239-246 (2015). 284. Strzhemechny, M. A. and R. J. Hemley, Effects of rotational states on the c/a ratio in the solid hydrogens, Phys. Rev. B 91, 144102 (2015). 283. Baldini, M., T. Muramatsu, M. Sherafati, H. K. Mao, L. Malavasi, P. Postorino, S. Satpathy, and V. V. Struzhkin, Origin of colossal magneto-resistance in manganites, Proc. Nat. Acad. Sci. 112, 10869-10872 (2015). 282. Talaie, E., V. Duffort, H. L. Smith, B. Fultz, and L. F. Nazar, Structure of the high voltage phase of layered P2-Na2/3-z[Mn1/2Fe1/2]O2 and the positive effect of Ni substitution on its stability, Energy Environ. Sci. 8, 2512-2523 (2015). 281. Stavrou, E., X. J. Chen, A. R. Oganov, A. F. Wang, Y. J. Yan, X. G. Luo, X. H. Chen, and A. F. Goncharov, Formation of As-As interlayer bonding in the collapsed tetragonal phase of NaFe2As2 under pressure, Sci. Rep. 5, 9868 (2015). 280. Xu, E. S., P. E. Lammert, and V. H. Crespi, Systematic enumeration of sp3 nanothreads, Nano Lett. 15, 5124-5130 (2015). 279. Hemawan, K. W. and R. J. Hemley, Optical emission diagnostics of microwave plasma CVD single crystal diamond synthesis, JVST A 33, 061302 (2015). 278. Murialdo, M., N. P. Stadie, N. P. Ahn, and B. Fultz, Krypton adsorption on zeolite-templated carbon and anomalous surface thermodynamics, Langmuir 31, 7991-7998 (2015). 277. Geng, H. Y., R. Hoffmann, and Q. Yu, On lattice stability and the high pressure melting mechnanism of dense hydrogen up to 1.5 TPa, Phys. Rev. B 92, 104103 (2015). 276. Xu, E. S., P. E. Lammert, and V. H. Crespi, Systematic enumeration of sp3 nanothreads, Nano Lett. 15, 5124-5130 (2015). 275. Haberl, B., M. Guthrie, S. V. Sinogeikin, G. Shen, J. S. Williams, and J. E. Bradby, Thermal evolution of the metastable r8 and bc8 polymorphs of silicon, High Press. Res. 35, 99-116 (2015). 274. Naumov, I. I. and R. J. Hemley, Origin of transitions between metallic and insulating states in simple metals, Phys. Rev. Lett. 114, 156403 (2015). 273. Zhao, Z., E. F. Wang, H. Yan, Y. Kono, B. Wen, L. Bai, F. Shi, J. Zhang, C. Kenney-Benson, C. Park, Y. Wang, and G. Shen, Nanoarchitectured materials composed of fullerene-like speroids and disordered graphene layers with tunable mechanical properties, Nature Comm. 6, 6212 (2015). 272. Badding, J. V. and V. H. Crespi, Synthesizing carbon nanothreads from Benzene, SPIE Newsroom, DOI: 10.1117/1112.1201501.1005713 (2015). 271. Goncharov, A. F., S. S. Lobanov, X. Tan, G. T. Hohensee, D. G. Cahill, J. F. Lin, S. M. Thomas, T. Okuchi, and N. Tomioka, Experimental study of thermal conductivity at high pressures: Implications for the deep Earth's interior, Phys. Earth Planet. Inter. 247, 11-16 (2015). 270. Ye, X., R. Hoffmann, and N. W. Ashcroft, Theoretical study of phase separation of scandium hydrides under high pressure, J. Phys. Chem. C 119, 5614-5625 (2015). 269. Stagno, V., M. Mandal, K. Landskrom, and Y. Fei, High-pressure synthesis of mesoporous stishovite: Potential applications in mineral physics, Phys. Chem. Minerals 42, 509-515 (2015). 268. Mauger, L., M. S. Lucas, J. A. Munoz, S. J. Tracy, M. Kresch, Y. Xiao, P. Chow, and B. Fultz, Nonharmonic phonons in -iron at high temperatures, Phys. Rev. B 90, 064303 (2015). 267. Kim, D. Y., S. Stefanoski, O. O. Kurakevych, and T. A. Strobel, Synthesis of an open-framework allotrope of ​silicon, Nature Mat. 14, 169-173 (2015). 266. Murialdo, M., N. P. Stadie, C. C. Ahn, and B. Fultz, Observation and investigation of increasing isoteric heat of adsorption of ethane on zeolite-templated carbon, J. Phys. Chem. C 119, 944-950 (2015). 265. Fitzgibbons, T. C., M. Guthrie, E. S. Xu, V. H. Crespi, S. K. Davidowski, G. D. Cody, N. Alem, and J. V. Badding, Benzene-derived carbon nanothreads, Nature Mater. 14, 43-47 (2015). 264. Sun, Y., L. Wang, Y. Liu, and Y. Ren, Birnessite-type MnO2 nanosheets with layered structures under high pressure: Elimination of crystalline stacking faults and oriented laminar assembly, Small 11​, 300-305 (2015). 263. Wang, L., Solvated fullerenes, a new class of carbon materials suitable for high-pressure studies: A review, J. Phys. Chem. Solids 84, 85-95 (2015). 262. Zhao, W. Y., J. L. Bischof, J. Hutasoit, X. Liu, T. C. Fitzgibbons, J. R. Hayes, P. J. A. Sazio, C. Liu, J. K. Jain, J. V. Badding, and M. H. W. Chan, Single-fluxon controlled resistance switching in centimeter-long superconducting gallium-indium eutectic nanowires, Nano Lett. 15, 153-158 (2015). 261. Tulk, C. A., S. Machida, D. D. Klug, H. Lu, M. Guthrie, and J. Molaison, The structure of CO2 hydrate between 0.7 and 1.0 GPa, J. Chem. Phys. 141, 174503 (2014). 260. Lin, J. F., E. E. Alp, and A. F. Goncharov, Raman and nuclear resonant spectroscopy in geosciences, Treatise on Geochemistry 15, 195-211 (2014). 259. Chen, B., K. Lutker, J. Lei, J. Yan, S. Yang, and H. K. Mao, Detecting grain rotation at the nanoscale, Proc. Nat. Acad. Sci. 111, 3350-3353 (2014). 258. Yang, W., F. J. Jia, L. Y. Tang, Q. Tao, Z. A. Xu, and X. J. Chen, Structural feature controlling superconductivity in compressed BaFe2As2, J. Appl. Phys. 115, 083915 (2014). 257. Sun, Y., J. Chen, V. Drozd, A. Durigin, S. Najiba, and X. Liu, Phase boundary of pressure-induced I4mm to Cmc21 transition in ammonia borane at elevated temperature determined using Raman spectroscopy, Int. J. Hydrogen Energy 39, 8293-8302 (2014). 256. Yu, Z., L. Wang, L. Wang, H. Liu, J. Zhao, C. Li, S. Sinogeikin, W. Wu, J. Luo, N. Wang, K. Yang, Y. Zhao, and H. K. Mao, Conventional empirical law reverses in the phase transition of 122-type iron-based superconductors, Sci. Reports 4, 7172 (2014). 255. Yang, W., High-pressure studies with microdiffraction, in Strain and Dislocation Gradients from Diffraction (eds. R. Barabash and Ice, G.), 438-450 (Imperial College Press, London, 2014). 254. Abrecht, D. G., J. A. Muñoz, H. L. Smith, and B. Fultz, Spin-state effects on the thermal dihydrogen release from solid-state [MH(η2-H2)dppe2]+ (M = Fe, Ru, Os) organometallic complexes for hydrogen storage applications, J. Phys. Chem. C 118, 1783-1792 (2014). 253. Ahart, M., A. Karandikar, S. A. Gramsch, R. Boehler, and R. J. Hemley, High P-T Brillouin scattering study of H2O melting to 26 GPa, High Press. Res. 34, 327-336 (2014). 252. Anderson, A. J., H. Yan, R. A. Mayanovic, G. Solferino, and C. Benmore, High-energy x-ray diffraction of a hydrous silicate liquid under conditions of high pressure and temperature in a modified hydrothermal diamond anvil cell, High Press. Res. 34, 100-109 (2014). 251. Armstrong, M. R., J. Crowhurst, S. Bastea, J. M. Zaug, and A. F. Goncharov, Sub-100 ps laser-driven dynamic compression of solid deuterium with a ~40 μJ laser pulse, Appl. Phys. Lett. 105, 021904 (2014). 250. Chemelewski, W. D., H. C. Lee, J. F. Lin, A. J. Bard, and C. B. Mullins, Amorphous FeOOH oxygen evolution reaction catalyst for photoelectrochemical water splitting J. Am. Chem. Soc. 136, 2843-2850 (2014). 249. Chen, J., T. Yu, S. Huang, J. Girard, and X. Liu, Compressibility of liquid FeS measured using X-ray radiograph imaging, Phys. Earth Planet. Int. 228, 294-299 (2014). 248. Ding, Y., C. C. Chen, Q. Zeng, H. S. Kim, M. J. Han, M. Balasubramanian, R. Gordon, F. Li , L. Bai, D. Popov, S. M. Heald, T. Gog, H. K. Mao, and M. van Veenendaal, Novel high-pressure monoclinic metallic phase of V2O3, Phys. Rev. Lett. 112, 056401 (2014). 247. Fan, C. Z., J. Li, M. Hu, Z. S. Zhao, B. Xu, and J. L. He, A novel layer-structured PtN2: First-principles calculations J. Superhard Mater. 35, 339-349 (2014). 246. Gao, G., N. W. Ashcroft, M. Miao, and R. Hoffmann, Novel Si networks in the Ca/Si phase diagram under pressure, J. Phys. Chem. C 118, 25167-25175 (2014). 245. Haberl, B., M. Guthrie, B. D. Malone, J. S. Smith, S. V. Sinogeikin, M. L. Cohen, J. S. Williams, G. Shen, and J. E. Bradby, Controlled formation of metastable germanium polymorphs, Phys. Rev. B 89, 144111 (2014). 244. Hermann, A., N. W. Ashcroft, and R. Hoffmann, Lithium hydroxide, LiOH, at elevated densities, J. Chem. Phys. 141, 024505 (2014). 243. Hu, M., Q. Huang, Z. Zhao, B. Xu, D. Yu, and J. He, Superhard and high-strength yne-diamond semimetals Diamond Rel. Mater. 46, 15-20 (2014). 242. Huang, Q. W., G. H. Zhong, J. Zhang, X. M. Zhao, C. Zhang, H. Q. Lin, and X. J. Chen, Constraint on the potassium content for the superconductivity of potassium-intercalated phenanthrene, J. Chem. Phys. 140, 114301 (2014). 241. Hwang, C., D. Y. Kim, D. A. Siegel, K. T. Chan, J. F. Noffsinger, A. V., M. L. Cohen, B. Johansson, J. B. Neaton, and A. Lanzara, Ytterbium-driven strong enhancement of electron-phonon coupling in graphene, Phys. Rev. B 90, 115417 (2014). 240. Kong, P. P., F. Sun, L. Y. Xing, J. Zhu, S. J. Zhang, W. M. Li, Q. Q. Liu, X. C. Wang, S. M. Feng, X. H. Yu, J. L. Zhu, R. C. Yu, W. G. Yang, G. Y. Shen, Y. S. Zhao, R. Ahuja, H. K. Mao, and C. Q. Jin, Superconductivity in strong spin orbital coupling compound Sb2Se3, Sci. Reports 4, 6679 (2014). 239. Kurakevych, O. O., Y. Le Godec, T. A. Strobel, D. Y. Kim, W. Crichton, and J. Guignard, High-pressure and high-temperature stability of antifluorite Mg2C by in situ x-ray diffraction and ab initio calculations, J. Phys. Chem. C 118, 8128-8133 (2014). 238. Lin, J. F., J. Wu, J. Zhu, Z. Mao, A. H. Said, B. M. Leu, J. Cheng, Y. Uwakoto, C. Jin, and J. Zhou, Abnormal elastic and vibrational behaviors of magnetite at high pressures, Sci. Reports 4, 6282 (2014). 237. Liu, J., J. F. Lin, Z. Mao, and V. B. Prakapenka, Thermal equation of state and spin transition of magnesiosiderite at high pressure and temperature, Am. Mineral. 99, 84-93 (2014). 236. Liu, L., Y. Kono, C. Kenney-Benson, W. Yang, Y. Bi, and G. Shen, Chain breakage in liquid sulfur at high pressures and high temperatures, Phys. Rev. B 89, 174201 (2014). 235. Liu, Y., J. Wang, M. Azuma, W. L. Mao, and W. Yang, Five-dimensional visualization of phase transition in BiNiO3, Appl. Phys. Lett. 104, 043108 (2014). 234. Lü, X., W. Yang, Z. Quan, T. Lin, L. Bai, L. Wang, F. Huang, and Y. Zhao, Enhanced electron transport in Nb-doped TiO2 nanoparticles via pressure-induced phase transitions J. Am. Chem. Soc. 136, 419-426 (2014). 233. Mandal, M., F. Haso, T. Liu, Y. Fei, and K. Landskron, Size tunable synthesis of solution processable diamond nanocrystals, Chem. Commun. 50 (2014). 232. Mandal, S., R. E. Cohen, and K. Haule, Pressure suppression of electron correlation in the collapsed tetragonal phase of CaFe2As2: A DFT-DMFT investigation, Phys. Rev. B 90, 060501(R) (2014). 232. Mandal, S., R. E. Cohen, and K. Haule, Strong pressure-dependent electron-phonon coupling in FeSe Phys. Rev. B 89, 220502 (2014). 230. Mayanovic, R. A., H. Yan, A. D. Brandt, Z. Wu, M. Mandal, K. Landskron, and W. A. Bassett, Mechanical and hydrothermal stability of mesoporous materials at extreme conditions, Micropor. Mesopor. Mater. 195, 161-166 (2014). 229. Miao, M. S. and R. Hoffmann, High pressure electrides: A predictive chemical and physical theory, Acc. Chem. Res. 47, 1311 (2014). 228. Naumov, I. I. and R. J. Hemley, Aromaticity, closed-shell effects, and metallization of hydrogen, Acc. Chem. Res., 3551-3559 (2014). 227. Nayak, A. P., S. Bhattacharyya, J. Zhu, J. Liu, X. Wu, T. Pandey, C. Jin, A. K. Singh, D. Akinwande, and J. F. Lin, Pressure-induced semiconducting to metallic transition in multilayered molybdenum disulphide, Nature Comm. 5, 3731 (2014). 226. Rettie, A. J. E., K. C. Klavetter, J. F. Lin, A. Dolocan, H. Celio, A. Ishiekwene, H. L. Bolton, K. N. Pearson, N. T. Hahn, and C. B. Mullins, Improved visible light harvesting of WO3 by incorporation of sulfur or iodine: A tale of two impurities, Chem. Mater. 26, 1670-1677 (2014). 225. Sato, H., H. Yamaoka, Y. Utsumi, H. Nagata, M. A. Avila, R. A. Ribiero, K. Umeo, T. Takabatake, Y. Zekko, J. Mizuki, J. F. Lin, N. Hiraoka, H. Ishii, K. D. Tsue, H. Namatame, and M. Taniguchi, Pressure-induced valence change of YbNiGe3 investigated by resonant x-ray emission spectroscopy at the Yb L3 edge, Phys. Rev. B 89, 045112 (2014). 224. Skinner, L. B., C. J. Benmore, J. K. R. Weber, M. A. Williamson, A. Tamalonis, A. Hebden, T. Wiencek, O. I. G. Alderman, M. Guthrie, I. Liebowitz, and J. B. Parise, Molten uranium dioxide structure and dynamics, Science 346, 984-987 (2014). 223. Stagno, V., L. Bindi, Y. Shibazaki, Y. Tange, Y. Higo, H. K. Mao, P. J. Steinhardt, and Y. Fei, Icosahedral AlCuFe quasicrystal at high pressure and temperature and its implications for the stability of icosahedrite Sci. Reports 4, 5869 (2014). 222. Stagno, V., M. Mandal, W. Yang, C. Ji, H. K. Mao, and K. Landskron, Synthesis of mesostructured stishovite from FDU-12/carbon composite, Micropor. Mesopor. Mater. 187, 145-149 (2014). 221. Strobel, T. A., O. O. Kurakevych, D. Y. Kim, Y. Le Godec, W. Crichton, J. Guignard, N. Guignot, G. D. Cody, and A. R. Oganov, Synthesis of b-Mg2C3: A monolithic high-pressure polymorph of magnesium sesquicarbide, Inorg. Chem. 53, 7020-7027 (2014). 220. Tan, H. J., H. L. Smith, L. Kim, T. K. Harding, S. C. Jones, and B. Fultz, Electrical cycling and lithium insertion in nanostructured FeF3 cathodes, J. Electrochem. Soc. 161, A445-A449 (2014). 219. Tang, L. Y., Q. Tao, Z. A. Xu, and X. J. Chen, Pressure-induced phase coexistence in BaFe1.8Co0.2As2, J. Appl. Phys. 115, 143904 (2014). 218. Tracy, S. J., L. Mauger, H. J. Tan, Muñoz, Y. M. Xiao, and B. Fultz, Polaron-ion correlations in LixFePO4 studied by nuclear resonant scattering at elevated pressure and temperature, Phys. Rev. B 90, 094303 (2014). 217. Wang, S., A. F. Kemper, M. Baldini, M. C. Shapiro, S. C. Riggs, Z. Zhao, Z. Liu, T. P. Devereaux, T. H. Geballe, I. R. Fisher, and W. L. Mao, Bandgap closure and reopening in CsAuI3 at high pressure, Phys. Rev. B 89, 245109 (2014). 216. Wang, S., X. Yu, J. Zhang, Y. Zhang, L. Wang, K. Leinenweber, H. Xu, D. Popov, C. Park, W. Yang, D. He, and Y. Zhao, Crystal structures, elastic properties, and hardness of high-pressure synthesized CrB2 and CrB4, J. Superhard Mater. 36, 279-287 (2014). 215. Wang, S., J. Zhang, J. Yan, X. J. Chen, V. V. Struzhkin, W. Tabis, N. Barišić, M. K. Chan, C. Dorow, X. Zhao, M. Greven, W. L. Mao, and T. H. Geballe, Strain derivatives of Tc in HgBa2CuO4+δ: The CuO2 plane alone is not enough, Phys. Rev. B 89, 024515 (2014). 214. Yan, X., X. Ren, D. He, B. Chen, and W. Yang, Mechanical behaviors and phase transition of Ho2O3 nanocrystals under high pressure, J. Appl. Phys. 116, 033507 (2014). 213. Zekko, Y., Y. Yamamoto, H. Yamaoka, F. Tajima, T. Nishioka, F. Strigari, A. Severing, J. F. Lin, N. Hiraoka, H. Ishii, K. D. Tsuei, and J. Mizuki, Correlation between the valence state of cerium and the magnetic transition in Ce(Ru1−xFex)2Al10 studied by resonant x-ray emission spectroscopy, Phys. Rev. B 89, 125108 (2014). 212. Zeng, Z., Q. Zeng, W. L. Mao, and S. Qu, Phase transitions in metastable phases of silicon, J. Appl. Phys. 115, 103514 (2014). 211. Zha, C. S., R. E. Cohen, H. K. Mao, and R. J. Hemley, Raman measurements of phase transitions in dense solid hydrogen and deuterium to 325 GPa, Proc. Nat. Acad. Sci. 111, 4792-4797 (2014). 210. Zhang, L., Y. Meng, W. Yang, L. Wang, W. L. Mao, Q. S. Zeng, J. S. Jeong, A. J. Wagner, K. A. Mkhoyan, W. Liu, R. Xu, and H. K. Mao, Disproportionation of (Mg,Fe)SiO3 perovskite in Earth's deep lower mantle, Science 344, 877-882 (2014). 209. Zhao, Z., S. Wang, A. R. Oganov, P. Chen, Z. Liu, and W. L. Mao, Tuning the crystal structure and electronic states of Ag2Se: Structural transitions and metallization under pressure, Phys. Rev. B 89, 180102(R) (2014). 208. Zhao, Z., S. Wang, T. F. Qi, Q. Zeng, S. Hirai, P. P. Kong, L. Li, C. Park, S. J. Yuan, C. Q. Jin, G. Cao, and W. L. Mao, Pressure induced second-order structural transition in Sr3Ir2O7, J. Phys. Cond. Matt. 26, 215402 (2014). 207. Belonoshko, A. B., M. Ramzan, H. K. Mao, and R. Ahuja, Atomic diffusion in solid molecular hydrogen, Sci. Rep. 3, 2340 (2013). 206. Boehler, R., M. Guthrie, J. Molaison, A. M. dos Santos, S. V. Sinogeikin, S. Machida, N. Pradhan, and C. A. Tulk, Large-volume diamond cells for neutron diffraction above 90 GPa, High Press. Res. 33, 546-544 (2013). 205. Cadien, A., Q. Y. Hu, Y. Meng, Y. Q. Cheng, M. W. Chen, J. F. Shu, H. K. Mao, and H. W. Sheng, First-order liquid-liquid phase transition in cerium, Phys. Rev. Lett. 110, 125503 (2013). 204. Cheng, J. G., K. E. Kweon, J. S. Zhou, J. A. Alonso, P. P. Kong, Y. Liu, C. Jin, J. Wu, J. F. Lin, S. A. Larregola, W. Yang, G. Shen, A. H. MacDonald, A. Manthiram, G. S. Hwang, and J. B. Goodenough, Anomalous perovskite PbRuO3 stabilized under high pressure, Proc. Nat. Acad. Sci. 110, 20003-20007 (2013). 203. Cohen, R. E., I. I. Naumov, and R. J. Hemley, Electronic excitations and metallization of solid hydrogen, Proc. Nat. Acad. Sci. 110, 13757-13762 (2013). 202. Dalton, D. A., W. P. Hsieh, G. T. Hohensee, D. G. Cahill, and A. F. Goncharov, Effect of mass disorder on the lattice thermal conductivity of MgO periclase under pressure, Sci. Reports 3, 2400 (2013). 201. Derzsi, M., A. Hermann, R. Hoffmann, and W. Grochala, The close relationship between the crystal structures of Mo and MSO4 (M = group 10, 11, or 12 metal), and the predicted structures of AuO and PtSO4, Euro. J. Inorg. Chem. 29, 5094-5102 (2013). 200. Freiman, Y. A., A. Grechnev, S. M. Tretyak, A. F. Goncharov, and R. J. Hemley, Sound velocities in solid hydrogen under pressure, Low Temp. Phys. 39, 423-426 (2013). 199. Gao, G., N. W. Ashcroft, and R. Hoffmann, The unusual and the expected in the Si/C phase diagram J. Am. Chem. Soc. 135, 11651-11656 (2013). 198. Gao, G., R. Hoffmann, N. W. Ashcroft, H. Liu, A. Bergara, and Y. Ma, Theoretical study of the ground-state structures and properties of niobium hydrides under pressure, Phys. Rev. B 88, 184104 (2013). 197. Gavriliuk, A. G., I. S. Lyubutin, S. S. Starchikov, A. A. Mironovich, S. G. Ovchinnikov, I. A. Trojan, Y. Xiao, P. Chow, S. V. Sinogeikin, and V. V. Struzhkin, The magnetic P-T phase diagram of langasite Ba3TaFe3Si2O14 at high hydrostatic pressures up to 38 GPa, Appl. Phys. Lett. 103, 162402 (2013). 196. Goncharov, A. F., R. T. Howie, and A. F. Goncharov, Hydrogen at extreme pressures, J. Low. Temp. Phys. 39, 523-553 (2013). 195. Goncharov, A. F., R. T. Howie, and E. Gregoryanz, Hydrogen at extreme pressure, Low Temp. Phys. 39, 402-408 (2013). 194. Goncharov, A. F., J. S. Tse, H. Wang, J. Yang, V. V. Struzhkin, R. T. Howie, and E. Gregoryanz, Bonding, structures, and band gap closure of hydrogen at high pressures, Phys. Rev. B 87, 024101 (2013). 193. Guthrie, M., R. Boehler, C. A. Tulk, J. Molaison, A. M. dos Santos, K. Li, and R. J. Hemley, Neutron diffraction observations of interstitial protons in dense ice, Proc. Nat. Acad. Sci. 110, 10552-10556 (2013). 192. Haberl, B., M. Guthrie, D. J. Sprouster, J. S. Williams, and J. E. Bradby, New insight into pressure-induced phase transitions of amorphous silicon: The roll of impurities, J. Appl. Cryst. 46, 758-768 (2013). 191. Hermann, A., N. W. Ashcroft, and R. Hoffmann, Binary compounds of boron and beryllium: a rich structural arena with space for predictions, Chem. Eur. J. 19, 4184–4197 (2013). 190. Hermann, A., R. Hoffmann, and N. W. Ashcroft, Condensed astatine: monatomic and metallic, Phys. Rev. Lett. 111, 116404 (2013). 189. Hirai, S., A. M. dos Santos, M. C. Shapiro, J. J. Molaison, N. Pradhan, M. Guthrie, C. A. Tulk, I. R. Fisher, and W. L. Mao, Giant atomic displacement at a magnetic phase transition in metastable Mn3O4, Phys. Rev. B 87, 014417 (2013). 188. Howie, R. T., E. Gregoryanz, and A. F. Goncharov, Hydrogen (deuterium) vibron frequency as a pressure comparison gauge at multi-Mbar pressures, J. Appl. Phys. 114, 073505 (2013). 187. Huang, Q. W., J. Zhang, A. Berlie, Z. X. Qin, X. M. Zhao, J. B. Zhang, L. Y. Tang, J. Liu, C. Zhang, G. H. Zhong, H. Q. Lin, and X. J. Chen, Structural and vibrational properties of phenanthrene under pressure, J. Chem. Phys. 139, 104302 (2013). 186. Hunter, L., J. Gordon, S. Peck, D. Ang, and J. F. Lin, Using the Earth as a polarized electron source to search for long-range spin-spin interactions, Science 339, 928-932 (2013). 185. Jarrige, I., H. Yamaoka, J. P. Rueff, J. F. Lin, M. Taguchi, N. Hiraoka, H. Ishii, K. D. Tsuei, K. Imura, T. Matsumura, A. Ochiai, H. S. Suzuki, and A. Kotani, Unified understanding of the valence transition in the rare-earth monochalcogenides under pressure, Phys. Rev. B 87, 115107 (2013). 184. Jiang, H., R. Xu, C. C. Chen, W. Yang, J. Fan, X. Tao, C. Song, Y. Kohmura, T. Xiao, Y. Fei, T. Ishikawa, W. L. Mao, and J. Miao, Three-dimensional coherent x-ray diffraction imaging of molten iron in mantle olivine at nanoscale resolution, Phys. Rev. Lett. 110, 205501 (2013). 183. Kao, L. T., C. Y. Shi, J. Wang, W. L. Mao, Y. Liu, and W. Yang, Nanoscale elemental sensitivity study of Nd2Fe14B using absorption correlation tomography, Micro. Res. Tech. 76, 1112-1117 (2013). 182. Kong, P. P., J. L. Zhang, S. J. Zhang, J. Zhu, Q. Q. Liu, R. C. Yu, Z. Fang, C. Q. Jin, W. Yang, X. H. Yu, J. L. Zhu, and Y. S. Zhao, Superconductivity of the topological insulator Bi2Se3 at high pressure, J. Phys. : Cond. Matt. 25, 362204 (2013). 181. Kurakevych, O. O., T. A. Strobel, D. Y. Kim, and G. D. Cody, Synthesis of Mg2C: A magnesium methanide, Angew. Chem. Int. Ed. 52, 8930-8933 (2013). 180. Kurakevych, O. O., T. A. Strobel, D. Y. Kim, T. Muramatsu, and V. V. Struzhkin, Na-Si clathrates are high-pressure phases: A melt-based route to control stoichiometry and properties, Cryst. Growth Des. 13, 303-307 (2013). 179. Li, Y. L., Z. Wei, H. Q. Lin, H. K. Mao, and R. Ahuja, Pressure induced superconductivity in CaC2, Proc. Nat. Acad. Sci. 110, 9289-9294 (2013). 178. Lin, C., J. Liu, J. F. Lin, X. Li, Y. Li, Q. Zhang, L. Xiong, and R. Li, Garnet-to-perovskite transition in Gd3Sc2Ga3O12 at high pressure and high temperature, Inorg Chem. 52, 431-434 (2013). 177. Lin, C. L., Y. C. Li, X. D. Li, R. Li, J. F. Lin, and J. Liu, Pressure-induced structural evolution and amorphization in Eu3Ga5O12, J. Appl. Phys. 114, 163521 (2013). 176. Lobanov, S. S., P. N. Chen, X. J. Chen, C. S. Zha, K. D. Litasov, H. K. Mao, and A. F. Goncharov, Carbon precipitation from heavy hydrocarbon fluid in deep planetary interiors, Nature Comm. 4, 2446 (2013). 175. Lou, H., X. Wang, Q. Cao, D. Zhang, J. Zhang, T. Hu, H. K. Mao, and J. Z. Jiang, Negative expansions of interatomic distances in metallic melts, Proc. Nat. Aca. Sci. 110, 10068-10072 (2013). 174. Lu, X., Q. Hu, W. Yang, L. Bai, H. Sheng, L. Wang, F. Huang, J. Wen, D. J. Miller, and Y. Zhao, Pressure-induced amorphization in single-crystal Ta2O5 nanowires: A kinetic mechanism and improved electrical conductivity, J. Am. Chem. Soc. 135, 13947-13953 (2013). 173. Lyubutin, I. S., V. V. Struzhkin, A. A. Mironivich, A. G. Gavriliuk, P. G. Naumov, J. F. Lin, S. G. Ovchinnikov, S. V. Sinogeikin, P. Chow, Y. Xiao, and R. J. Hemley, Quantum critical point and spin fluctuations in the lower-mantle ferropericlase, Proc. Nat. Acad. Sci. 110, 7142-7147 (2013). 172. Mandal, M. and K. Landskron, Synthetic chemistry with periodic mesostructures at high pressure, Acc. Chem. Res. 46, 2536-2544 (2013). 171. Mandal, M., V. Stagno, Y. Fei, and K. Landskron, Investigation of high-pressure and temperature behavior of surfactant-containing periodic mesostructured silicas, Cryst. Growth Des. 13, 15–18 (2013). 170. Mayanovic, R. A., H. Yan, A. J. Anderson, and G. Solferino, Giulio investigation of the structural environment of Ta in a silicate glass and water system under high P-T conditions, J. Non-Crystal. Solids 368, 71-78 (2013). 169. Naumov, I. I., R. E. Cohen, and R. J. Hemley, Graphene physics and insulator-metal transition in compressed hydrogen, Phys. Rev. B 88, 045125 (2013). 168. Prasad, D. L. V. K., N. W. Ashcroft, and R. Hoffmann, Evolving structural diversity and metallicity in compressed lithium azide, J. Phys. Chem. C 117, 20838-20846 (2013). 167. Prasad, D. L. V. K., N. M. Gerovac, M. J. Bucknum, and R. Hoffman, Squaroglitter: A 3,4-connected carbon net, J. Chem. Theory Comput. 9, 3855-3859 (2013). 166. Qin, Z. X., X. J. Chen, C. Zhang, L. Y. Tang, G. Zhong, H. Q. Lin, Y. Meng, and H. K. Mao, Vibrational and structural properties of tetramethyltin under pressure, J. Chem. Phys. 138, 024307 (2013). 165. Rettie, A. J. E., H. C. Lee, L. G. Marshall, J. F. Lin, C. Capan, J. Lindermuth, J. S. McCloy, J. Zhou, A. J. Bard, and C. B. Mullins, Combined charge carrier transport and photoelectrochemical characterization of BiVO4 single crystals: Intrinsic behavior of a complex metal oxide, J. Am. Chem. Soc. 135, 11389-11396 (2013). 164. Scott, H. P., V. M. Doczy, M. R. Frank, M. Hasan, J. F. Lin, and J. Yang, Magnesite formation from MgO and CO2 at the pressures and temperatures of Earth’s mantle, Am. Mineral. 98, 1211-1218 (2013). 163. Shi, C. Y., L. Zhang, W. Yang, Y. Liu, J. Wang, Y. Meng, J. C. Andrews, and W. L. Mao, Formation of an interconnected network of iron melt at Earth’s lower mantle conditions, Nature Geosci. 6, 971-975 (2013). 162. Stadie, N. P., M. Murialdo, C. C. Ahn, and B. Fultz, Anomalous isosteric enthalpy of adsorption of methane on xeolite-templated carbon, J. Am. Chem. Soc. 135, 990-993 (2013). 161. Stagno, V., D. O. Ojwang, C. A. McCammon, and D. Frost, The oxidation state of the mantle and the extraction of carbon from Earth's interior, Nature 493, 84-88 (2013). 160. Wang, S., S. Hirai, M. C. Shapiro, S. C. Riggs, T. H. Geballe, W. L. Mao, and I. R. Fisher, Pressure-induced symmetry breaking in tetragonal CsAuI3, Phys. Rev. B 87, 054104 (2013). 159. Wu, J., J. F. Lin, X. C. Wang, Q. Q. Liu, J. L. Zhu, Y. Xiao, P. Chow, and C. Jin, Pressure-decoupled magnetic and structural transitions of the parent compound of iron-based 122 superconductors BaFe2As2, Proc. Nat. Acad. Sci. 110, 17263-17266 (2013). 158. Xiong, L., J. Liu, L. Bai, Y. Li, C. Lin, D. He, F. Peng, and J. F. Lin, Radial x-ray diffraction of tungsten tetraboride to 86 GPa under nonhydrostatic compression, J. Appl. Phys. 113, 033507 (2013). 157. Yamaoka, H., N. Tsujii, Y. Utsumi, H. Sato, I. Jarrige, Y. Yamamoto, J. F. Lin, N. Hiraoka, H. Ishii, K. D. Tsuei, and J. Mizuki, Valence transitions in the heavy-fermion compound YbCuAl as a function of temperature and pressure, Phys. Rev. B 87, 205120 (2013). 156. Yan, H., R. A. Mayanovic, J. Demster, and A. J. Anderson, In situ monitoring of the adsorption of Co2+ on the surface of Fe3O4 nanoparticles in high-temperature aqueous fluids, J. Supercrit. Fluids 81, 175-182 (2013). 155. Yang, W., X. Huang, R. Harder, J. N. Clark, I. K. Robinson, and H. K. Mao, Coherent diffraction imaging of nanoscale strain evolution in a single crystal under high pressure, Nature Comm. 4, 1680 (2013). 154. Zeng, Q., W. L. Mao, H. Sheng, Z. Zeng, Q. Hu, Y. Meng, H. Lou, F. Peng, W. Yang, S. V. Sinogeikin, and J. Z. Jiang, The effect of composition on pressure-induced devitrification in metallic glasses, Appl. Phys. Lett. 102, 171905 (2013). 153. Zhang, L., Y. Meng, P. Y. Dera, W., W. L. Mao, and H. K. Mao, Single-crystal structure determination of (Mg,Fe)SiO3 postperovskite, Proc. Nat. Acad. Sci. 110, 6292-6295 (2013). 152. Zhang, W., A. R. Oganov, A. F. Goncharov, Q. Zhu, S. E. Boulfelfel, A. O. Lyakhov, E. Stavrou, M. Somayazulu, V. B. Prakapenka, and Z. Konopkova, Unexpected stable stoichiometries of sodium chlorides, Science 342, 1502-1505 (2013). 151. Zhao, X. M., J. Zhang, A. Berlie, Z. X. Qin, Q. W. Huang, J. Wei, S. Jiang, J. B. Zhang, L. Y. Tang, J. Liu, C. Zhang, G. Zhong, H. Q. Lin, and X. J. Chen, Phase transformations and vibrational properties of coronene under pressure, J. Chem. Phys. 139, 144308 (2013). 150. Zhao, Z., S. Wang, H. Zhang, and W. L. Mao, Pressure-induced structural transitions and metallization in Ag2Te, Phys. Rev. B 88, 024120 (2013). 149. Zhong, G. H., C. Zhang, G. F. Wu, Z. B. Huang, X. J. Chen, and H. Q. Lin, First-principles investigations on the magnetic property in tripotassium doped picene, J. Appl. Phys. 113, 17E131 (2013). 148. Zhu, J., J. L. Zhang, P. P. Kong, S. J. Zhang, X. H. Yu, J. L. Zhu, Q. Q. Liu, X. Li, R. Ahuja, W. Yang, G. Shen, H. K. Mao, H. M. Weng, X. Dai, Z. Fang, Y. Zhao, and C. Q. Jin, Superconductivity in topological insulator Sb2Te3 induced by pressure, Sci. Reports 3, 2016 (2013). 147. Ahart, M., R. E. Cohen, R. J. Hemley, S. Sinogeikin, O. Shebanova, D. Ikuta, and Z. G. Ye, Pressure-dependence of the monoclinic phase in the Pb(Mg1/3Nb2/3)O3-PbTiO3 solid solutions, Phys. Rev. B 86, 224111 (2012). 146. Amin, S., E. N. Rissi, K. McKiernan, and J. L. Yarger, Determining the equation of state of amorphous solids at high pressure using optical microscopy, Rev. Sci. Instrum. 83, 033702 (2012). 145. Amin, S. A., K. Leinenweber, C. J. Benmore, R. Weber, and J. L. Yarger, Characterizing pressure induced coordination changes in CaAl2O4 glass using 27Al NMR, J. Phys. Chem. C 116, 2068-2073 (2012). 144. Armstrong, M. R., J. C. Crowhurst, S. Bastea, W. M. Howard, J. M. Zaug, and A. F. Goncharov, Prospects for achieving high dynamic compression with low energy, Appl. Phys. Lett. 101, 101904 (2012). 143. Baldini, M., Y. Ding, S. Wang, Y. Lin, C. A. Tulk, A. M. dos Santos, J. F. Mitchell, D. Haskel, and W. L. Mao, Pressure-induced tuning of a magnetic phase separation in Nd0.53Sr0.47MnO3, Phys. Rev. B 86, 094407 (2012). 142. Chen, B., K. Lutker, S. V. Raju, J. Yan, W. Kanitpanyacharoen, J. Lei, S. Yang, H. R. Wenk, H. K. Mao, and Q. Williams, Texture of nanocrystalline nickel: Probing the lower size limit of dislocation activity, Science 338, 1448-1451 (2012). 141. Ding, Y., Z. Cai, Q. Hu, H. Sheng, J. Chang, R. J. Hemley, and W. L. Mao, Nanoscale diffraction imaging of the high-pressure transition in Fe1-xO, Appl. Phys. Lett. 100, 041903 (2012). 140. Ding, Y., J. Fernandez-Rodriguez, J. Kim, F. Li, D. Casa, M. Upton, T. Gog, H. K. Mao, and M. van Veenendaal, Spin-ordering mediated orbital hybridization in CoO at high pressures, Phys. Rev. B 86, 094107 (2012). 139. Gamaly, E. G., A. Vailionis, V. Mizeikis, W. Yang, A. V. Rode, and S. Juodkazis, Warm dense matter at the bench-top: Fs-laser-induced confined micro-explosion, High Energ. Dens. Phys. 8, 13-17 (2012). 138. Garimella, S., V. Drozd, A. Durygin, and J. Chen, High pressure Raman and x-ray diffraction studies on the decomposition of tungsten carbonyl, J. Appl. Phys. 11, 112606 (2012). 137. Gavriliuk, A. G., V. V. Struzhkin, S. G. Ovchinnikov, Y. Yu, M. M. Korshunov, A. A. Mironovich, J. F. Lin, and C. Jin, P-T phase diagram of iron arsenide superconductor NdFeAsO0.88F0.12, Europhys. Lett. 100, 46005 (2012). 136. Guo, J., X. J. Chen, J. Dai, C. Zhang, J. Guo, X. Chen, Q. Wu, D. Gu, P. Gao, L. Yang, K. Yang, X. Dai, H. K. Mao, L. Sun, and Z. Zhao, Pressure-driven quantum criticality in iron-selenide superconductors, Phys. Rev. Lett. 108, 197001 (2012). 135. Guthrie, M., C. A. Tulk, J. Molaison, and A. M. dos Santos, Local structural motifs and extended-range order in liquid and solid ammonia under pressure, Phys. Rev. B 85, 184205 (2012). 134. Hermann, A., N. W. Ashcroft, and R. Hoffmann, High pressure ices, Proc. Nat. Acad. Sci. 109, 745-750 (2012). 133. Hermann, A., N. W. Ashcroft, and R. Hoffmann, Making sense of boron-rich binary Be−B phases, Inorg. Chem. 51, 9066-9075 (2012). 132. Hermann, A., B. L. Ivanov, N. W. Ashcroft, and R. Hoffmann, LiBeB: A predicted phase with structural and electronic peculiarities, Phys. Rev. B 86, 014104 (2012). 131. Hermann, A., A. McSorley, N. W. Ashcroft, and R. Hoffmann, From Wade-Mingos to Zintl-Klemm at 100 GPa: Binary compounds of boron and lithium, J. Am. Chem. Soc. 134, 18606-18618 (2012). 130. Hermann, A. A., A. Suarez-Alcubilla, I. G. Gurtubay, L. M. Yang, A. Bergara, N. W. Ashcroft, and R. Hoffmann, LiB and its boron-deficient variants under pressure, Phys. Rev. B 86, 144110 (2012). 129. Howie, R. T., C. L. Guillaume, T. Scheler, A. F. Goncharov, and E. Gregoryanz, Mixed molecular and atomic phase of dense hydrogen, Phys. Rev. Lett. 108, 125501 (2012). 128. Jia, F. J., W. Yang, L. J. Li , Z. A. Xu, and X. J. Chen, Structural properties of BaFe1.8Ni0.2As2 under pressure, Physica C 474, 1-4 (2012). 127. Kim, D. Y., P. Srepusharawoot, C. J. Pickard, R. J. Needs, T. Bovornratanaraks, R. Ahuja, and U. Pinsook, Phase stability and superconductivity of strontium under pressure, Appl. Phys. Lett. 101, 052604 (2012). 126. Kong, L., L. Wang, S. Zhang, O. Tschauner, Y. Zhao, W. Yang, H. Liu, and H. K. Mao, In situ structure characterization of Pb(Yb1/2Nb1/2)O3-PbTiO3 crystals under high pressure-temperature, Appl. Phys. Lett. 101, 062904 (2012). 125. Labet, V., P. Gonzalez-Morelos, R. Hoffmann, and N. W. Ashcroft, A fresh look at dense hydrogen under pressure: I. An introduction to the problem, and an index probing equalization of H-H distances, J. Chem. Phys. 136, 074501 (2012). 124. Labet, V., R. Hoffmann, and N. W. Ashcroft, A fresh look at dense hydrogen under pressure: II. Chemical and physical models aiding our understanding of evolving H-H distances, J. Chem. Phys. 136, 074502 (2012). 123. Labet, V., R. Hoffmann, and N. W. Ashcroft, A fresh look at dense hydrogen under pressure: III. Two competing effects and the resulting intramolecular H-H separation in solid hydrogen under pressure, J. Chem. Phys. 136, 074503 (2012). 122. Labet, V., R. Hoffmann, and N. W. Ashcroft, A fresh look at dense hydrogen under pressure: IV. Two structural models on the road from paired to monatomic hydrogen, via a possible non-crystalline phase, J. Chem. Phys. 136, 074504 (2012). 121. Lebègue, S., C. M. Araujo, D. Y. Kim, M. Ramzan, H. K. Mao, and R. Ahuja, Semimetallic dense hydrogen above 260 GPa, Proc. Nat. Acad. Sci. 108, 9766-9769 (2012). 120. Li, B., Y. Ding, W. Yang, L. Wang, B. Zou, J. Shu, S. Sinogeikin, C. Park, G. Zou, and H. K. Mao, Calcium with the β-tin structure at high pressure and low temperature, Proc. Nat. Acad. Sci. 109, 16459–16462 (2012). 119. Lin, J. F., J. Liu, C. Jacobs, and V. B. Prakapenka, Vibrational and elastic properties of ferromagnesite across the electronic spin-pairing transition of iron, Am. Mineral. 97, 583-591 (2012). 118. Liu, X. M., Y. Tang, E. S. Xu, T. C. Fitzgibbons, G. S. Larsen, H. R. Gutierrez, H. H. Tseng, M. S. Yu, C. S. Tsao, J. V. Badding, V. H. Crespi, and A. D. Lueking, Evidence for ambient-temperature reversible catalytic hydrogenation in Pt-doped carbons, Nano Lett. 13, 137-141 (2012). 117. Machida, A., M. Honda, T. Hattori, A. Sano-Furukawa, T. Watanuki, Y. Katayama, K. Aoki, K. Komatsu, H. Arima, H. Ohshita, T. Otomo, M. Tsubota, K. Doi, T. Ichikawa, Y. Kojima, and D. Y. Kim, Formation of NaCl-type monodeuteride LaD by disproportionation reaction of LaD2, Phys. Rev. Lett. 108, 205501 (2012). 116. Mao, Z., J. F. Lin, S. D. Jacobsen, T. S. Duffy, Y. Y. Chang, J. R. Smyth, D. J. Frost, E. H. Hauri, and V. B. Prakapenka, Sound velocities of hydrous ringwoodite to 16 GPa and 673 K, Earth Planet. Sci. Lett. 331-332, 112-119 (2012). 115. Mayanovic, R. A., H. A. N. Dharmagunawardhane, A. J. Anderson, S. Pascarelli, and G. Aquilanti, Monitoring synchrotron x-ray-induced radiolysis effects on metal (Fe, W) ions in high temperature aqueous fluids, J. Synch. Rad. 19, 797-805 (2012). 114. Mayanovic, R. A., H. Yan, A. J. Anderson, P. R. Meredith, and W. A. Bassett, In situ x-ray absorption spectroscopic study of the adsorption of Ni2+ on Fe3O4 nanoparticles in supercritical aqueous fluids, J. Phys. Chem. C 116, 2218-2225 (2012). 113. Mohanty, P., B. Kokoszka, C. Liu, M. Weinberger, M. Mandal, V. Stagno, Y. Fei, and K. Landskron, Large-pore periodic mesoporous silicas with crystalline channel walls and exceptional hydrothermal stability synthesized by a general high-pressure nanocasting route, Micropor. Mesopor. Mater. 152, 214-218 (2012). 112. Najiba, S. and J. Chen, High-pressure study of lithium amidoborane using Raman spectroscopy and insight into dihydrogen bonding absence, Proc. Nat. Acad. Sci. 109, 19140–19144 (2012). 111. Najiba, S., J. Chen, V. Drozd, A. Durygin, and Y. Sun, Tetragonal to orthorhombic phase transition of ammonia borane at low temperature and high pressure, J. Appl. Phys. 111, 112618 (2012). 110. Niu, H., X. Q. Chen, S. Wang, D. Li, W. L. Mao, and Y. Li, Families of superhard crystalline carbon allotropes constructed via cold compression of graphite and nanotubes, Phys. Rev. Lett. 108, 135501 (2012). 109. Peng, S., J. S. Okasinski, J. D. Almer, Y. Ren, L. Wang, W. Yang, and Y. Sun, Real-time probing of the synthesis of colloidal silver nanocubes with time-resolved high-energy synchrotron x-ray diffraction, J. Phys. Chem. C 116, 11842−11847 (2012). 108. Prasad, D. L. V. K., N. W. Ashcroft, and R. Hoffmann, Lithium amide (LiNH2) under pressure, J. Phys. Chem. A 116, 10027−10036 (2012). 107. Qin, Z. X., C. Zhang, L. Y. Tang, G. H. Zhong, H. Q. Lin, and X. J. Chen, High-pressure phases of a hydrogen-rich compound: Tetramethylgermane, Phys. Rev. B 86, 184110 (2012). 106. Rissi, E. N., E. Soignard, K. A. McKiernan, C. Benmore, and J. L. Yarger, Pressure-induced crystallization of amorphous red phosphorus, Solid State Comm. 152, 390-394 (2012). 105. Rose, M. C. and R. E. Cohen, Giant electrocaloric effect around Tc, Phys. Rev. Lett. 109 (2012). 104. Shen, G., D. Ikuta, S. V. Sinogeikin, Q. Li, Y. Zhang, and C. Chen, Direct observation of a pressure-induced precursor lattice in silicon, Phys. Rev. Lett. 109, 205503 (2012). 103. Skinner, L. B., C. J. Benmore, S. Antao, E. Soignard, S. Amin, E. Bychkov, E. N. Rissi, J. B. Parise, and J. L. Yarger, Structural changes in vitreous GeSe4 under pressure, J. Phys. Chem. C 116, 2212-2217 (2012). 102. Stadie, N. P., J. J. Vajo, R. C. Cumberland, A. C. Wilson, C. C. Ahn, and B. Fultz, Zeolite templated carbon materials for high pressure hydrogen storage, Langmuir 28, 10057–10063 (2012). 101. Sun, L., X. J. Chen, J. Guo, P. Gao, Q. Z. Huang, H. Wang, M. Fang, X. Chen, G. Chen, Q. Wu, C. Zhang, D. Gu, X. Dong, L. Wang, K. Yang, A. Li, X. Dai, H. K. Mao, and Z. Zhao, Re-emerging superconductivity at 48 kelvin in iron chalcogenides, Nature 483, 67–69 (2012). 100. Sun, Z., J. Zhou, H. K. Mao, and R. Ahuja, Peierls distortion mediated reversible phase transition in GeTe under pressure, Proc. Nat. Aca. Sci. 16, 5948-5952 (2012). 99. Tulk, C. A., D. D. Klug, A. M. dos Santos, G. Karotis, M. Guthrie, J. J. Molaison, and N. Pradhan, Cage occupancies in the high pressure structure H methane hydrate: A neutron diffraction study, J. Chem. Phys. 136, 054502 (2012). 98. Wang, J., W. Yang, S. Wang, X. Xiao, F. D. Carlo, Y. Liu, and W. L. Mao, High pressure nano-tomography using an iterative method, J. Appl. Phys. 111, 112626 (2012). 97. Wang, L., B. Liu, H. Li, W. Yang, Y. Ding, S. V. Sinogeikin, Y. Meng, Z. Liu, X. C. Zeng, and W. L. Mao, Long-range ordered amorphous carbon clusters: A crystalline material with amorphous building blocks, Science 337, 825-828 (2012). 96. Wen, X. D., T. Yang, R. Hoffmann, N. W. Ashcroft, R. L. Martin, S. P. Rudin, and J. X. Zhu, Graphane nanotubes, ACS Nano 6, 7142–7150 (2012). 95. Wilding, M., M. Guthrie, S. Kohara, C. L. Bull, J. Akola, and M. G. Tucker, The structure of MgO–SiO2 glasses at elevated pressure J. Phys. : Cond. Matt. 24, 225403 (2012). 94. Xu, M., Y. Q. Cheng, L. Wang, H. W. Sheng, Y. Meng, W. G. Yang, X. D. Hang, and E. Ma, Pressure tunes electrical resistivity by four orders of magnitude in amorphous Ge2Sb2Te5 phase-change memory alloy Proc. Nat. Acad. Sci. 109, E1055-E1062 (2012). 93. Yamanaka, T., M. Ahart, Y. Nakamoto, Z. G. Ye, S. A. Gramsch, H. K. Mao, and R. J. Hemley, Anharmonic atomic vibrations in the relaxor ferroelectric Pb(Mg1/3Nb2/3)O3 under pressure, Phys. Rev. B 86, 174108 (2012). 92. Yamaoka, H., Y. Zekko, I. Jarrige, J. F. Lin, N. Hiraoka, H. Ishii, K. D. Tsuei, and J. Mizuki, Ruby pressure scale in a low-temperature diamond anvil cell, J. Appl. Phys. 112, 124503 (2012). 91. Yamaoka, H., Y. Zekko, A. Kotani, I. Jarrige, N. Tsujii, J. F. Lin, J. Mizuki, N. Hiraoka, H. Ishii, and K. D. Tsuei, Electronic transition in high-pressure low temperature CePd2Si2 studied by resonant x-ray emission spectroscopy, Phys. Rev. B 86, 235131 (2012). 90. Yan, H., R. A. Mayanovic, and J. Demster, In situ XANES study of Co2+ ion adsorption on Fe3O4 nanoparticles in supercritical aqueous fluids, MRS Proceedings 1383, a07-10 (2012). 89. Yang, L., A. Karandikar, and R. Boehler, Flash heating in the diamond cell: Melting curve of rhenium, Rev. Sci. Instrum. 83, 063905 (2012). 88. Yu, T., J. Chen, L. Ehm, S. Huang, Q. Guo, S. Luo, and J. B. Parise, Study of liquid gallium at high pressure using synchrotron x-ray, J. Appl. Phys. 111, 112629 (2012). 87. Zaleski-Ejgierd, P., V. Labet, T. A. Strobel, R. Hoffman, and N. W. Ashcroft, WHn under pressure, J. Phys. : Cond. Matt. 24, 155701 (2012). 86. Zhang, F., D. Legut, Z. J. Lin, Y. S. Zhao, H. K. Mao, and S. Veprek, Stability and strength of transition-metal tetraborides and triborides, Phys. Rev. Lett. 108, 255502 (2012). 85. Zhang, S. J., J. L. Zhang, X. H. Yu, J. Zhu, P. P. Kong, S. M. Feng, Q. Q. Liu, L. X. Yang, X. C. Wang, L. Z. Cao, W. G. Yang, L. Wang, H. K. Mao, Y. S. Zhao, H. Z. Liu, X. Dai, Z. Fang, S. C. Zhang, and C. Q. Jin, The comprehensive phase evolution for Bi2Te3 topological compound as function of pressure, J. Appl. Phys. 111, 112630 (2012). 84. Zhu, L., Z. Wang, Y. Wang, G. Zou, H. K. Mao, and Y. Ma, Spiral chain O4 form of dense oxygen, Proc. Nat. Acad. Sci. 109, 751-753 (2012). 83. Ahart, M., M. Somayazulu, S. A. Gramsch, R. Boehler, H. K. Mao, and R. J. Hemley, Brillouin scattering of H2O ice to megabar pressures, J. Chem. Phys. 134, 124517 (2011). 82. Baldini, M., V. V. Struzhkin, A. F. Goncharov, P. Postorino, and W. L. Mao, Persistence of Jahn Teller distortion up to the insulator to metal transition in LaMnO3, Phys. Rev. Lett. 106, 066402 (2011). 81. Baldini, M., W. Yang, G. Aquilanti, L. Zhang, Y. Ding, S. Pascarelli, and W. L. Mao, High pressure EXAFS measurements of crystalline Ge using nano-crystalline diamond anvils, Phys. Rev. B 84, 014111 (2011). 80. Blobaum, K. J. M., J. R. Jeffries, A. J. Schwartz, H. Cynn, W. Yang, and W. J. Evans, In situ x-ray diffraction study of the δ→α isothermal martensitic transformation kinetics in a Pu-Ga alloy, J. Nuclear Mater. 412, 327–333 (2011). 79. Chen, P. N., C. S. Zha, X. J. Chen, J. Shu, R. J. Hemley, and H. K. Mao, Raman study of phase transitions in compressed methane using moissanite anvil cells, Phys. Rev. B 84, 104110 (2011). 78. Chen, X. J., C. Zhang, Y. Meng, R. Q. Zhang, H. Q. Lin, V. V. Struzhkin, and H. K. Mao, β-tin-->imma-->sh phase transitions of germanium, Phys. Rev. Lett. 106, 135502 (2011). 77. Couvy, H., D. Lahiri, J. Chen, A. Agarwal, and G. Sen, Nanohardness and Young's modulus of nanopolycrystalline diamond, Scr. Mater. 64, 1019-1022 (2011). 76. Crowhurst, J., M. R. Armstrong, K. B. Knight, and J. M. Zaug, Invariance of the dissipative action at ultrahigh strain rates above the strong shock threshold, Phys. Rev. Lett. 107, 144302 (2011). 75. Dharmagunawardhane, H. A. N., Investigations of radiolysis effects on iron species and reaction of Fe3O4 nanoparticles with metal ions under hydrothermal conditions, M. S. Thesis, Missouri State University (2011). 74. Guillaume, C. L., E. Gregoryanz, O. Degtyareva, M. I. McMahon, M. Hanfland, S. Evans, M. Guthrie, S. V. Sinogeikin, and H. K. Mao, Cold melting and solid structures of dense lithium, Nature Phys. 7, 211–214 (2011). 73. Kim, D. Y., R. H. Scheicher, C. J. Pickard, R. J. Needs, and R. Ahuja, Predicted formation of superconducting platinum-hydride crystals under pressure in the presence of molecular hydrogen, Phys. Rev. Lett. 107, 117002 (2011). 72. Kurzydlowski, D., P. Zaleski-Ejgierd, W. Grochala, and R. Hoffmann, Freezing in resonance structures for better packing: XeF2 Becomes (XeF+)(F-) at large compression, Inorg. Chem. 50, 3832-3840 (2011). 71. Li, B., Y. Ding, D. Kim, R. Ahuja, G. Zou, and H. K. Mao, Rhodium dihydride (RhH2) with high volumetric hydrogen density, Proc. Nat. Acad. Sci. 108, 18618-18621 (2011). 70. Li, Z., L. Wang, B. Liu, J. Wang, B. Liu, Q. Li, B. Zou, T. Cui, Y. Meng, H. K. Mao, Z. Liu, and J. Liu, The structural transition behavior of CdSe/ZnS core/shell quantum dots under high pressure, Phys. Stat. Sol. B 248, 1149–1153 (2011). 69. Lin, J. F., J. S. Tse, E. E. Alp, J. Zhao, M. Lerche, W. Sturhahn, Y. Xiao, and P. Chow, Phonon density of states of Fe2O3 across high-pressure structural and electronic transitions, Phys. Rev. B 84, 064424 (2011). 68. Lin, Y., L. Zhang, H. K. Mao, P. Chow, Y. Xiao, M. Baldini, J. Shu, and W. L. Mao, Amorphous diamond: A high-pressure superhard carbon allotrope, Phys. Rev. Lett. 107, 175504 (2011). 67. Lin, Z. J., J. Z. Zhang, B. S. Li, L. P. Wang, H. K. Mao, R. J. Hemley, and Y. Zhao, Superhard diamond/tungsten carbide nanocomposites, Appl. Phys. Lett. 98, 121914 (2011). 66. Liu, Q., X. Yu, X. Wang, Z. Deng, Y. Lv, J. Zhu, S. Zhang, H. Liu, W. Yang, L. Wang, H. K. Mao, G. Shen, Z. Y. Lu, Y. Ren, Z. Chen, Z. Lin, Y. Zhao, and C. Jin, Pressure-induced isostructural phase transition and correlation of FeAs coordination with the superconducting properties of 111-type Na1–xFeAs, J. Am. Chem. Soc. 133, 7892–7896 (2011). 65. Liu, W., Q. Zeng, Q. Jiang, L. Wang, and B. Li, Density and elasticity of Zr46Cu37.6Ag8.4Al8 bulk metallic glass at high pressure, Scr. Mater. 65, 497-500 (2011). 64. Mao, H. K., Y. Ding, Y. Xiao, P. Chow, J. Shu, S. Lebègue, A. Lazicki, and R. Ahu, Electronic dynamics and plasmons of sodium under compression, Proc. Nat. Acad. Sci. 108, 20434–20437 (2011). 63. Mao, Z., S. M. Dorfman, S. Shieh, J. F. Lin, V. Prakapenka, Y. Meng, and T. S. Duffy, Equation of state of a high-pressure phase of Gd3Ga5O12, Phys. Rev. B 83, 054114 (2011). 62. Mao, Z., J. F. Lin, H. P. Scott, H. Watson, V. B. Prakapenka, Y. Xiao, P. Chow, and C. McCammon, Iron-rich perovskite in the Earth's lower mantle, Earth Planet. Sci. Lett. 309, 179-184 (2011). 61. Meredith, P. R., A. J. Anderson, and R. A. Mayanovic, An in-situ investigation of the solubility of molybdenum trioxide in oxygenated water at supercritical conditions, Proceedings of the Fifth International Symposium on Supercritical Water-Cooled Reactors, (Vancouver, Canada, 2011). 60. Peng, Q. and R. E. Cohen, Origin of pyroelectricity in LiNbO3, Phys. Rev. B 83, 220103(R) (2011). 59. Sha, X. and R. E. Cohen, First-principles studies of electrical resistivity of iron under pressure J. Phys. Cond. Matt. 23, 075401 (2011). 58. Shu, J., X. Chen, I. M. Chou, W. Yang, J. Hu, R. J. Hemley, and H. K. Mao, Structural stability of methane hydrate at high pressures, Geosci. Frontiers 2, 93-100 (2011). 57. Subramanian, N., A. F. Goncharov, V. V. Struzhkin, M. Somayazulu, and R. J. Hemley, Bonding changes in hot fluid hydrogen at megabar pressures, Proc. Nat. Acad. Sci. 108, 6014-6019 (2011). 56. Sun, Y., W. Yang, Y. Ren, L. Wang, and C. Lei, Multiple-step phase transformation in silver nanoplates under high pressure, Small 7, 606-611 (2011). 55. Sun, Z., J. Zhou, Y. Pan, Z. Song, H. K. Mao, and R. Ahuja, Pressure-induced reversible amorphization and an amorphous-amorphous transition in Ge2Sb2Te5 phase-change memory material, Proc. Nat. Acad. Sci. 108, 10410 (2011). 54. Vailionis, A., E. G. Gamaly, V. Mizeikis, W. Yang, A. V. Rode, and S. Juodkazis, Evidence of super-dense aluminium synthesized by ultrafast microexplosion, Nature Comm. 2, 10.1038/ncomms1449 (2011). 53. Wang, L., Y. Ding, U. Patel, W. Yang, Z. Xiao, Z. Cai, W. L. Mao, and H. K. Mao, Studying single nanocrystals under high pressure using an x-ray nanoprobe, Rev. Sci. Instrum. 82, 043903 (2011). 52. Wang, L., W. Yang, Y. Xiao, B. Liu, P. Chow, G. Shen, W. L. Mao, and H. K. Mao, Application of a new composite cubic-boron nitride gasket assembly for high pressure inelastic x-ray scattering studies of carbon related materials, Rev. Sci. Instrum. 82, 073902 (2011). 51. Wen, X. D., L. Hand, V. Labet, T. Yang, R. Hoffmann, N. W. Ashcroft, A. R. Oganov, and A. O. Lyakhov, Graphanes: Sheets and stacking under pressure, Proc. Nat. Acad. Sci. 108, 6833–6837 (2011). 50. Wen, X. D., R. Hoffmann, and N. W. Ashcroft, Benzene under high pressure: A story of molecular crystals transforming to saturated networks, with a possible intermediate metallic phase, J. Am. Chem. Soc. 133, 9023–9035 (2011). 49. Yamada, A., Y. Wang, T. Inoue, W. Yang, C. Park, T. Yu, and G. Shen, High-pressure x-ray diffraction studies on the structure of liquid silicate using a Paris-Edinburgh type large volume press, Rev. Sci. Instrum. 82, 015103 (2011). 48. Yamaoka, H., I. Jarrige, N. Tsujii, M. Imai, J. F. Lin, M. Matsunami, R. Eguchi, M. Arita, K. Shimada, H. Namatame, M. Taniguchi, M. Taguchi, Y. Senba, H. Ohashi, N. Hiraoka, H. Ishii, and K. D. Tsuei, Electronic structure of YbGa1.15Si0:85 and YbGaxGe2-x probed by resonant x-ray emission and photoelectron spectroscopies, Phys. Rev. B 83, 104525 (2011). 47, Yamaoka, H., I. Jarrige, N. Tsujii, A. Kotani, J. F. Lin, F. Honda, R. Settai, O. Ōnuki, N. Hiraoka, H. Ishii, and K. D. Tsuei, Pressure and temperature dependences of the electronic structure of CeIrSi3 probed by resonant x-ray emission spectroscopy, J. Phys. Soc. Jpn. 80, 124701 (2011). 46. Yamaoka, H., I. Jarrige, N. Tsujii, J. F. Lin, T. Ikeno, Y. Isikawa, K. Nishimura, R. Higashinaka, H. Sato, N. Hiraoka, H. Ishii, and K. D. Tsuei, Strong coupling between 4f valence instability and 3d ferromagnetism in YbxFe4Sb12 studied by resonant x-ray emission spectroscopy, Phys. Rev. Lett. 107, 18618-18621 (2011). 45. Yan, H., R. A. Mayanovic, A. J. Anderson, and P. R. Meredith, An in situ x-ray spectroscopic study of Mo6+ speciation in supercritical aqueous solutions, Nucl. Instr. Meth. in Phys. Res. A 649, 207–209 (2011). 44. Zeleski-Ejgierd, P., N. W. Ashcroft, and R. Hoffmann, High pressure stabilization and emergent forms of PbH4, Phys. Rev. Lett. 107, 037002 (2011). 43. Zeng, Q., H. Sheng, Y. Ding, L. Wang, W. Yang, J. J. Z., W. L. Mao, and H. K. Mao, Long-range topological order in metallic glass, Science 332, 1404 (2011). 42. Zeng, Q. S., C. R. Rotundu, W. L. Mao, J. H. Dai, Y. M. Xiao, P. Chow, X. J. Chen, C. L. Qin, H. K. Mao, and J. Z. Jiang, Low temperature transport properties of Ce-Al metallic glasses, J. Appl. Phys. 109, 113716 (2011). 41. Zeng, Z., L. Wang, X. Ma, S. Qu, J. Chen, Y. Liu, and D. Yang, Improvement in the mechanical performance of Czochralski silicon under indentation by germanium doping, Scr. Mater. 64, 832-835 (2011). 40. Zhang, J. L., S. J. Zhang, H. M. Weng, W. Zhang, L. X. Yang, Q. Q. Liu, S. M. Feng, X. C. Wang, R. C. Yu, L. Z. Cao, L. Wang, W. G. Yang, H. Z. Liu, W. Y. Zhao, S. C. Zhang, X. Dai, Z. Fang, and C. Q. Jin, Pressure-induced superconductivity in topological parent compound Bi2Te3, Proc. Nat. Acad. Sci. 108, 24-28 (2011). 39. Zhang, R. F., Z. J. Lin, H. K. Mao, and Y. Zhao, Thermodynamic stability and unusual strength of ultra-incompressible rhenium nitrides, Phys. Rev. B 83, 060101 (2011). 38. Åberg, D., P. Erhart, J. Crowhurst, J. M. Zaug, A. F. Goncharov, and B. Sadigh, Pressure-induced phase transition in the electronic structure of palladium nitride, Phys. Rev. B 82, 104116 (2010). 37. Baldini, M., G. Aquilanti, H. K. Mao, W. Yang, G. Shen, S. Pascarelli, and W. L. Mao, High pressure EXAFS study of vitreous GeO2 to 44 GPa, Phys. Rev. B 81, 024201 (2010). 36. Benmore, C. J., E. Soignard, S. A. Amin, M. Guthrie, S. D. Shastri, P. L. Lee, and J. L. Yarger, Structural and topological changes in silica glass at pressure, Phys. Rev. B 81, 054105 (2010). 35. Chen, J., H. Couvy, H. Liu, V. Drozd, L. L. Daemen, Y. Zhao, and C. C. Kao, in Int. J. Hydrogen Energy (ed. V. C. de Zea Bermudez) 11064-11070 (Elsevier Ltd, 2010). 34. Chen, X. J., V. V. Struzhkin, Y. Yu, A. F. Goncharov, C. T. Lin, H. K. Mao, and R. J. Hemley, Enhancement of superconductivity by pressure-driven phase competition in electronic order, Nature 466, 950-953 (2010). 33. Cuk, T., D. A. Zocco, H. Eisaki, V. V. Struzhkin, F. M. Grosche, M. B. Maple, and Z. X. Shen, Signatures of pressure-induced superconductivity in insulating Bi1.98Sr2.06Y0.68CaCu2O8+δ, Phys. Rev. B 81, 184509 (2010). 32. Ganesh, P., E. Cockayne, M. Ahart, R. E. Cohen, B. Burton, R. J. Hemley, and Y. Ren, Origin of diffuse scattering in relaxor ferroelectrics, Phys. Rev. B 81, 144102 (2010). 31. Girard, J., J. Chen, P. Raterron, and C. Holyoke, Deformation of single crystal sample using D-DIA apparatus coupled with synchrotron x-rays: In situ stress and strain measurements at high pressure and temperature, J. Phys. Chem. Solids 71, 1053-1058 (2010). 30. Goncharov, A. F., V. B. Prakapenka, V. V. Struzhkin, I. Kantor, M. L. Rivers, and D. A. Dalton, X-ray diffraction in the pulsed laser heated diamond anvil cell, Rev. Sci. Instrum. 81, 113902 (2010). 29. Jin, X., X. Meng, Z. He, Y. Ma, B. Liu, T. Cui, G. Zou, and H. K. Mao, Superconducting high-pressure phases of disilane, Proc. Nat. Acad. Sci. 107, 9969-9973 (2010). 28. Kim, D. Y., R. H. Scheicher, H. K. Mao, T. W. Kang, and R. Ahuja, General trend for pressurized superconducting hydrogen-dense materials, Proc. Nat. Acad. Sci. 107, 2793–2796 (2010). 27. Klepeis, J. H. P., H. Cynn, W. J. Evans, R. E. Rudd, L. H. Yang, H. P. Liermann, and W. Yang, Diamond anvil cell measurement of high-pressure yield strength of vanadium using in situ thickness determination, Phys. Rev. B 81, 134107 (2010). 26. Lin, J. F., Z. Mao, H. Yavaş, J. Zhao, and L. Dubrovinsky, Shear wave anisotropy of textured hcp-Fe in the Earth's inner core, Earth Planet. Sci. Lett. 298, 361-366 (2010). 25. Lin, Z., L. Wang, J. Zhang, X. Y. Guo, W. Yang, H. K. Mao, R. J. Hemley, and Y. Zhao, Nanoscale twinning-induced elastic strength in silicon carbite nanowires, Scr. Mater. 63, 981-984 (2010). 24. Mao, H. K., E. L. Shirley, Y. Ding, P. Eng, Y. Q. Cai, P. Chow, Y. Xiao, J. Shu, R. J. Hemley, C. Kao, and W. L. Mao, Electronic structure of crystalline 4He at high pressures, Phys. Rev. Lett. 105, 186404 (2010). 23. Mao, W. L., L. Wang, Y. Ding, W. Yang, W. Liu, D. Y. Kim, W. Luo, R. Ahuja, Y. Meng, S. Sinogeikin, J. Shu, and H. K. Mao, Distortions and stabilization of simple-cubic calcium at high pressure and low temperature, Proc. Nat. Acad. Sci. 107, 9965-9968 (2010). 22. Repalle, S., J. Chen, V. Drodz, and W. Choi, The Raman spectroscopic studies of aligned MWCNTs treated under high pressure and high temperature, J. Phys. Chem. Solids 71, 1150-1153 (2010). 21. Ruiz-Fuertes, J., A. Karandikar, R. Boehler, and D. M. Errandonea, Microscopic evidence of a flat melting curve of tantalum, Phys. Earth Planet. Int. 181, 69-72 (2010). 20. Schwager, B., M. Ross, S. Japel, and R. Boehler, Melting of Sn at high pressure: Comparisons with Pb, J. Chem. Phys. 133, 084501 (2010). 19. Strobel, T. A., X. J. Chen, M. Somayazulu, and R. J. Hemley, Vibrational dynamics, intermolecular interactions, and compound formation in GeH4–H2 under pressure, J. Chem. Phys. 133, 164512 (2010). 18. Sun, Y., Y. Ren, D. R. Haeffner, J. D. Almer, L. Wang, W. Yang, and T. T. Truong, Nanophase evolution at semiconductor/electrolyte interface in situ probed by time-resolved high-energy synchrotron x-ray diffraction, Nano Lett. 10, 3747–3753 (2010). 17. Wang, L., Y. Ding, W. Yang, W. Liu, Z. Cai, J. Kung, J. Shu, R. J. Hemley, W. L. Mao, and H. K. Mao, Nanoprobe measurements of materials at megabar pressures, Proc. Nat. Acad. Sci. 107, 6140–6145 (2010). 16. Wang, L., W. Yang, Y. Ding, Y. Ren, S. Xiao, B. Liu, S. V. Sinogeikin, Y. Meng, D. J. Gosztola, G. Shen, R. J. Hemley, W. L. Mao, and H. K. Mao, Size-dependent amorphization of nanoscale Y2O3 at high pressure, Phys. Rev. Lett. 105, 095701 (2010). 15. Wang, S., W. L. Mao, A. P. Sorini, C. C. Chen, T. P. Devereaux, Y. Ding, Y. Xiao, P. Chow, N. Hiraoka, H. Ishii, Y. Q. Cai, and C. C. Kao, High-pressure evolution of Fe2O3 electronic structure revealed by x-ray absorption, Phys. Rev. B 82, 144428 (2010). 14. Yamaoka, H., I. Jarrige, A. Ikeda-Ohno, S. Tsutsui, J. F. Lin, N. Takeshita, K. Miyazawa, A. Iyo, H. Kito, H. Eisaki, N. Hiraoka, H. Ishii, and K. D. Tsuei, Hybridization and suppression of the superconductivity in CeFeAsO1-y: Pressure and temperature dependences of the electronic structure, Phys. Rev. B 82, 125123 (2010). 13. Yamaoka, H., I. Jarrige, N. Tsujii, J. F. Lin, N. Hiraoka, H. Ishii, and K. D. Tsuei, Temperature and pressure-induced valence transitions in YbNi2Ge2 and YbPd2Si2, Phys. Rev. B 82, 035111 (2010). 12. Yang, G., B. Bureau, T. Rouxel, Y. Gueguen, O. Gulbiten, C. Roiland, E. Soignard, J. L. Yarger, J. Troles, C. Sangleboeuf, and P. Lucas, Correlation between structure and physical properties of chalcogenide glasses in the AsxSe1−x system, Phys. Rev. B 82, 195206 (2010). 11. Zeng, Q. S., Y. Ding, W. L. Mao, W. Yang, S. V. Sinogeikin, J. Shu, H. K. Mao, and J. Z. Jiang, Origin of pressure-induced polyamorphism in Ce75Al25 metallic glass, Phys. Rev. Lett. 104, 105702 (2010). 10. Zeng, Q. S., V. V. Struzhkin, Y. Z. Fang, C. X. Gao, H. B. Luo, X. D. Wang, C. Lathe, W. L. Mao, F. M. Wu, H. K. Mao, and J. Z. Jiang, Properties of polyamorphous Ce75Al25 metallic glasses, Phys. Rev. B 82, 054111 (2010). 9. Zhang, C., X. J. Chen, Y. L. Li, V. V. Struzhkin, R. J. Hemley, H. K. Mao, R. Q. Zhang, and H. Q. Lin, Superconductivity in hydrogen-rich material: GeH4, J. Supercond. Nov. Magn. 23, 717–719 (2010). 8. Zhang, C., X. J. Chen, Y. L. Li, V. V. Struzhkin, H. K. Mao, R. Q. Zhang, and H. Q. Lin, Structural transitions of solid germane under pressure, Earth Planet. Sci. Lett. 90, 66006 (2010). 7. Zhang, L., P. Mohanty, N. Coombs, Y. Fei, H. K. Mao, and K. Landskron, Catalyst-free synthesis of transparent, mesoporous diamond monoliths from periodic mesoporous carbon CMK-8, Proc. Nat. Acad. Sci. 107, 13593-13596 (2010). 6. Zhang, S., X. J. Chen, R. Q. Zhang, and H. Q. Lin, Chemical trend of pressure-induced metallization in alkaline earth hydrides, J. Phys. Chem. C 114, 14614-14617 (2010). 5. Zhao, Q., Y. Fan, G. Wen, Z. Liu, H. Ma, X. Jia, G. Zou, and H. K. Mao, Shape-controlled synthesis of high-purity CrO2 under HTHP, Mater. Lett. 64, 592-595 (2010). 4. Li, Q., B. Liu, L. Wang, D. Li, R. Liu, B. Zou, T. Cui, G. Zou, Y. Meng, H. K. Mao, Z. Liu, J. Liu, and J. Li, Pressure-induced amorphization and polyamorphism in one-dimensional single-crystal TiO2 nanomaterials, J. Phys. Chem. Lett. 1, 309-314 (2009). 3. Lin, Z., L. Wang, J. Zhang, H. K. Mao, and Y. Zhao, Nanocrystalline tungsten carbide: As incompressible as diamond, Appl. Phys. Lett. 95, 211906 (2009). 2. Markopoulos, G., P. Kroll, and R. Hoffmann, Compressing the most hydrogen-rich inorganic ion, J. Am. Chem. Soc. 132, 748-755 (2009). 1. Zou, Y., B. Liu, L. Wang, D. Liu, S. Yu, P. Wang, X. Li, T. Wang, M. Yao, Q. Li, B. Zou, T. Cui, G. Zou, T. Wågberg, B. Sundq, and H. K. Mao, Rotational dynamics of confined C60 from near-infrared Raman studies under high pressure, Proc. Nat. Acad. Sci. 106, 22135–22138 (2009).